Annigeri is a town in Navalgund taluk of Dharwad district in Karnataka, located 20km west of Gadag enroute to Hubli and 35km from Hubli-Dharwad. It has an average elevation of 624 metres (2047 feet). 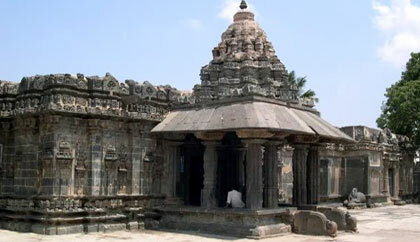 Annigeri is well known for the black stone temple Kalyani Chalukyas (Amrtesvara Temple), a temple of mythological figures supported by 76 columns, located in the Dharwad district. Annigeri also has temples dedicated to Banashankari, Basappa, Gajina Basappa and Hanuman. Places to visit The Amruteshwara Temple is situated in Annigeri town, Navalgund Taluq of Dharwad district in Karnataka. It is 25 km from Gadag. The main deity in this temple is Lord Shiva. The town is also the birthplace of the great Kannada poet, Adikavi Pampa. Annigeri was an important political and cultural center of ancient times. Various kings like the Chalukyas, Yadavas and the Hoysalas annexed the town, which once formed part of the kingdoms of the Kalachuris. Annigeri comes under the core area of Western Chalukya architectural activity in the modern Karnataka state. The Amrtesvara Temple is the finest examples produced by the later Chalukya architects. The Amrtesvara Temple was built in the Dharwad district in 1050 CE with dravida articulation, and was the first temple made of soapstone. This building was to be the prototype for later, more articulated structures such as the Mahadeva Temple at Itagi. Based on the general plan of the Amrtesvara Temple, the Mahadeva Temple was built in 1112 CE and has the same architectural components as its predecessor. There are, however, differences in their articulation. In 1157 the Kalachuris under Bijjala II captured Kalyani and occupied it for the next twenty years, forcing the Chalukyas to move their capital to Annigeri in the present-day Dharwad district.